This is how every Monday should begin. With dessert. I feel we are starting to get to know each other a little bit here at Shugary Sweets. But I think I have failed to let you all know one big secret about me. Rice Krispie treats are my absolute favorite dessert. Of all the things I make, good old fashioned krispie treats complete me. I have even perfected how to make rice krispie treats. But, I can’t very well share that recipe with all of you. How boring. Especially if you knew how often I make Krispie treats. It’s a very bad thing. You know it’s bad when you go to a church event and you elbow children out of the way just to make sure there are enough treats for yourself. Not that I have done that (I usually grab my dessert first instead). So, what do I do? I went and Pimped My Krispie treats. Yep. I do that a lot. Pimp things. Wait. What are we talking about? I mean food. I am so glad we’re friends here. Because of all of you, I made this incredible dessert. In my quest to make a Krispie treat you all would enjoy, I realized how many open bags of morsels, marshmallows and other stuff were in my pantry! Like an open bag of Heath bits. And about 6 bags of chocolate chips…from bittersweet to milk chocolate. So I present to you…Kitchen Sink Krispie Treats. Which, have you ever seen places that serve Kitchen Sink ice cream? Holy Cow, that’s a lot of food! Line a 13x9 dish with foil. Set aside. Melt butter in large saucepan. Add marshmallows and heat on low until smooth. Remove from heat and add butterscotch morsels. Stir until melted, fold in rice krispies. Pour into prepared 13x9. Allow to set while making the next layer. Melt vanilla bark in microwave safe bowl for one minute. Stir and heat another 15 seconds. If still not creamy heat in 15 second intervals until melted. Set aside for several minutes, to allow to cool slightly. Good time to wash the pot from the Krispie treats! When cooled slightly, quickly fold in mini marshmallows, peanut butter morsels and heath bits. Pour over prepared Krispie treats. In small bowl, melt milk chocolate morsels in microwave for 30 seconds, stir, and add by 15 second intervals until smooth. Pour chocolate in small ziploc bag, seal, and snip corner. Drizzle over Krispie bars. Refrigerate bars for best flavor. When set (about 1 hour), cut in squares and enjoy cold! What a sweet (pun intended) post! I love the visual of you elbowing the children out of line to get your dessert. =) These sound fabulous and I’m so glad you shared. I found you at MIYMM. Have a blessed week! mmm love these pimped-out rice krispie treats! With all that deliciousness, I don’t see how anyone could NOT like these! I WISH my Monday was starting off with those! Lovely rice krispies turned fancy! I’m new to your blog and love it! Your sidebar is addicting! Heath pieces are one of my downfalls…these look delicious! Now that is definitely the best way to start out a Monday. And the thought of you elbowing children out of the way to get to treats…totally cracking me up!!! You have the most delicious ideas. These look like the ultimate crispy treats. Thanks all, I want to make another batch because they seem to have disappeared. Hmmm….those pesky children! Now that is my idea of a great rice krispie treat. Thanks for sharing this one. Looks fantastic. Oh, my! These look sooooooo goood!!! Yum! My daughter would love to help make these! 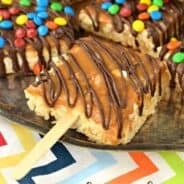 I’d love for you to share them on my summer dessert linky at Cajun Sugar Pie! I wish I was eating one of these right now. So many yummy ingredients! Yum, Rice Krispy treats are one of my favorite things as well! These look really yummy!! Found you on Tasty Tuesday. Arg I am way behind on blogs, so I am late to this post. I love that you put a lot of the ingredients on top, instead of just throwing everything in with the krispies. This way you get the krispy layer and then the ultra tasty marshmallow layer on top of it. Very tasty! I have been craving rice krispie treats for a while now!! Thanks for linking them up to 2 Maids a Baking! I LOVE Krispie Treats! You aren’t alone girlie! And your pimped treats SOUND DELISH!!! 🙂 Thanks for stopping by Truly Lovely! Hope to see you again soon! These Rice Krispie treats look so good! thanks for sharing this recipe. 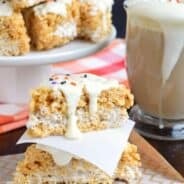 These rice krispie treats are to die for! I’m featuring them at this week’s Blogland’s Fabulous Friday Finds. Good golly! These sounds A-MAZING!!! Anything rice crispy and I’m all over it too. Love them! Can’t wait to make these! Thanks! These look delicious. Life is better with toffee chips! Thanks for sharing on A Well-Seasoned Life’s Sweet Indulgences Sunday. oh boy,i bet these were good.now that you confessed your rice krispie love, i will tell you that i make 1 1/2 batches, and eat the 1/2 batch right out of the pot. it is the simple things that bring me joy! thank you for sharing this great recipe with tuesday night supper club. 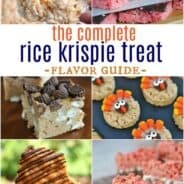 Confession time — fellow Rice Krispie Treat junkie here! Mine always come out a little flat and small, because I can’t help but eat them right out of the cooking pot! I can tell that these wouldn’t even make it out of the pot and my family would find me passed out on the kitchen floor in a blissful sugar coma, with a big ole sticky smile on my face! “Kitchen Sink Krispie Treats” ended up being a extremely excellent post, .